There are very few things in poker that are more fun than shoving. And if you are considering doing more 5bet bluff shoving preflop or semi-bluff jamming postflop, then understanding the math behind it is crucial. In this video I explain when and how to expand the math to make sure you are solving the spot correctly. If you’d rather read the script of this video, read on below. Otherwise, turn the video to 720p and enjoy easy-to-digest complicated poker math! Hello, and welcome to today’s Quick Plays video on advanced EV in poker. We’ve done another video on basic EV, but there are many situations in poker when a basic EV formula just doesn’t quite cut it. So in this video ill show you a more complex EV formula and how to use it with an example. The basic EV formula we worked with in the past was EV = (%W*$W)-(%L*$L). So essentially what we stand the win multiplied by how often we’ll win…minus what we stand to lose multiplied by how often we’ll lose. If this seems confusing at all, please first watch the basic EV poker video and then come back to this one. In this hand it folds to the cutoff who opens, we semi-bluff 3bet to $10 with 8♥ 6♥, the cutoff 4bets to $23 and we decide to 5bet shove. Like most plays we can proof this using some simple poker math, so let’s pull out our EV equation. Where “F” stands for “times villain folds” and “C” stands for “times villain calls”. And if you only know one of them, you can always figure out the other since their sum is always 100%. If you know F is 20%, then you take 100% – 20%, and get 80% for C.
%F/%C = These are estimations based upon how often you think villain will call your shove. If you think he was bluff 4betting a ton and thus wouldn’t be able to call your shove often…then F would be a very large percentage. Conversely, if you think villain were 4betting a strong range and would call your shove often, then F would be a small percentage and C would be quite large. %W/%L = These are based upon equity, which we can calculate using a free program like Equilab. The W% is your equity against the range villain would open, 4bet, and call your shove with. Let’s also assume that villain does bluff 4bet sometimes, so we assume he will 4bet/fold 25% of the time. This means F is 25% and C is 75%. Now for the dollar amounts and we can solve! The Pot before we shove is $34.50, so that’s easy. If we shove and villain wins we lose $96. Because villain has the shortest stack we can only lose $83 plus the $13 to match his 4bet. Our $10 3bet no longer belongs to us, and thus we cannot lose it once we shove. If we shove and villain calls we can win $117.5. Because we have the largest stack the shortcut is just current pot + villain’s stack. Now we have all of the necessary inputs! 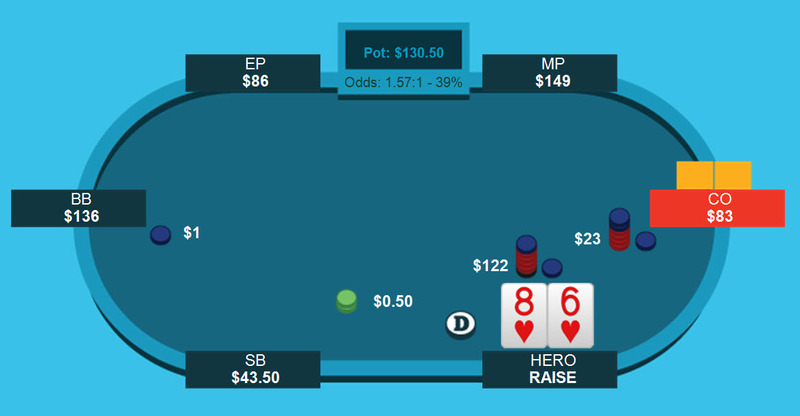 Assume for a moment that villain 4bet bluffs a LOT more often, and thus we can expect a fold from him 60% of the time. That changes F to 60% and C to 40%. Let’s also change his calling range from TT+/AK to TT+/AQ+. This increases our equity up to 30%, and thus changes both %W and %L. Now if we plug everything in we notice our EV jumps up to +$7.92. All of the sudden our shove is looking pretty good! With this formula the money won and lost will remain constant, but changes in ranges and frequencies can alter the outcome a ton. Essentially, the more villain folds and we pick up the pot outright the better for us. The more equity we have when called the better since we’ll pick up the all-in pot more often and lose less often. And if we can ever increase both our equity when called AND the times villain folds preflop…the better and better our semi-bluff will be. Knowing how and when to expand the basic EV formula can greatly benefit you on and off the table. Now in real time you won’t be able to plug-n-play with the formula…but with enough off-table practice things will get ingrained and you will be able to more correctly estimate the math at the tables. And to be honest, there are times when you could expand the formula even further…but just knowing how to do this gives you a nice mathematical leg-up on your opponents! Same as always, if you have any questions please don’t hesitate to let me know…otherwise…good luck and happy grinding!